Remembering THE WEST WING | Warped Factor - Words in the Key of Geek. Tony Fyler runs for office. There’s good TV. Then there’s great, epoch-making TV. Then there’s the kind of TV that’s up there among the choices for ‘things to do on your last hour alive’. Seeing the Earth from space? Cool. Last meal cooked by Heston Blumenthal? Weird, but cool. Carnal fun times with your greatest fantasy or your best beloved? Yummy. Or the West Wing pilot. Ach – now you’ve got yourself a tough decision. I’ve been a Who fan since I was eight. Episode one of Destiny of the Daleks, 1979. But when I first saw the West Wing pilot, the Doctor had his first ever equal in my esteem. 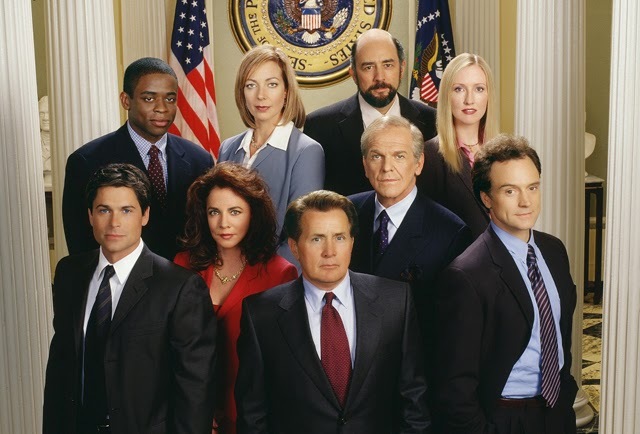 The West Wing, in case you poor deprived people have not yet seen it, heard of it or taken an interest in it, was a TV show set in the White House, with an ensemble cast interweaving personal and political storylines to create something absolutely geekworthy. Running for seven years during the George W Bush administration, it was more than that though – once a week, it told Democrats in what was increasingly a Republican-flavoured United States that they weren’t insane after all. There were still others out there who believed as they did. In many ways, the TV White House of Democratic President Jed Bartlet was a comfort blanket during the what-the-hell years. 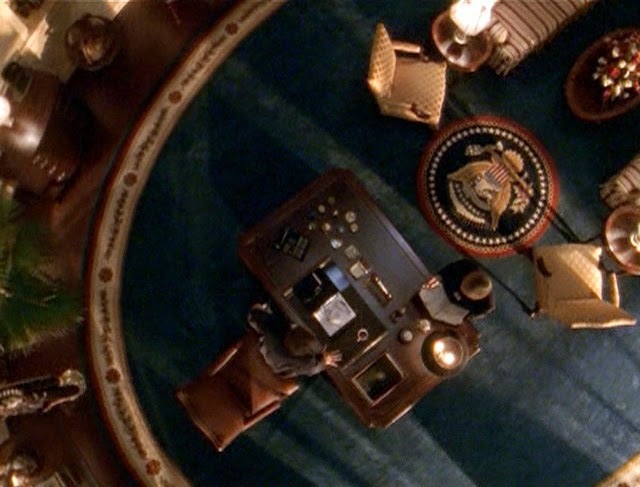 The West Wing was not always perfect by any means, and indeed whole seasons in the middle seemed to have lost focus, but it was perfect more often than most prime-time shows, especially shows with a political focus. And arguably, though there were some phenomenal episodes, it was never quite as perfect again as it was in its pilot episode. 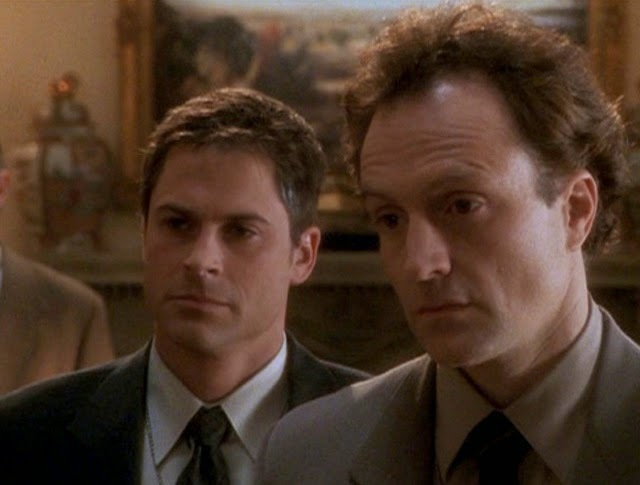 So what makes the West Wing pilot so practically perfect in every way? First and foremost it’s the writing. It’s the sort of writing that both keeps you entirely immersed in the action and at the same time pricks up your ears and makes you wonder just who in the modern world writes like this. The combination of characterization through dialogue, vignettes of comedy and drama, a tension that builds pace as so many potential situations of crisis or incident intertwine, is entirely sublime. It’s a perfect soufflé, a faultless tango, an inter-threaded Shakespeare comedy of a thing, if you envisage a Shakespeare comedy that’s actually funny. Simply listing all the crises in the pilot is likely to be an exhausting business, but they include: the President on holiday riding his bike into a tree; a fleet of Cuban refugees on rafts set to touch down in Miami; a tropical storm that might just potentially kill them all; a senator beginning a bid to oust the President at election time and hiring red-hot operative Mandy Hamilton to do it; to a leading member of the team, Sam Seabourn, ‘accidentally’ sleeping with a prostitute (as he’s asked, deadpan, by his boss, Toby Ziegler – ‘I don’t understand, did you trip over something?’) and then admitting as much to Chief of Staff Leo McGarry’s daughter; Deputy Chief of Staff Josh Lyman being almost guaranteed to lose his job for going on TV and sniping at a right-wing Christian, and a poll coming out that shows the White House has lost focus and energy. You see? You’re exhausted just having me list the crises, aren’t you? But the writing from creators Aaron Sorkin and Thomas Schlamme in the pilot episode delivers all of this and much more, but in a way that not only doesn’t exhaust the viewer, but picks them up and dances with them, through the issues and also through the character sketches which don’t dwell, but deliver perfect initial thumbnails to hook the audience and pull them into the flow of the episode. The writing also delivers radically different voices for each of the main players, each of them with their own strain of wit without seeming overly ‘written’ – you believe these are real people who know a lot and have a sense of humour, rather than being fictional characters for whom the lines have been written in advance. In addition to the writing, the cast are perfect right from the word go. There are pretty people in this White House, certainly – Sam Seabourn is played by one-time teen heart-throb Rob Lowe, and CJ Cregg the press secretary is embodied by Alison Janney, who frankly could make most people believe anything she wanted to by sheer force of personality alone. But the characters were cast with the long run in mind, meaning cork-and-velvet voiced distinguished actor John Spencer gives Leo McGarry an edge of populism while still feeling hard as nails when he needs to be. Bradley Whitford, then still relatively unknown to most of the world, brought intelligence and a sense of being a conniver with a good heart to Josh Lyman. Mrs Landingham, the politely waspish secretary to the President, came to life in a uniquely balanced way in the hands of frail-looking, steel-spined actress Kathryn Joosten. Dry, quiet Communications Director Toby Ziegler was played by dry, quite actor Richard Schiff as the heart of the social policy in the White House. And there, in the centre of it all, was a name. A name that had to have weight, and gravitas, and a gift for humour, and the ability to make you warm, and scared, and punch the air depending on his mood. 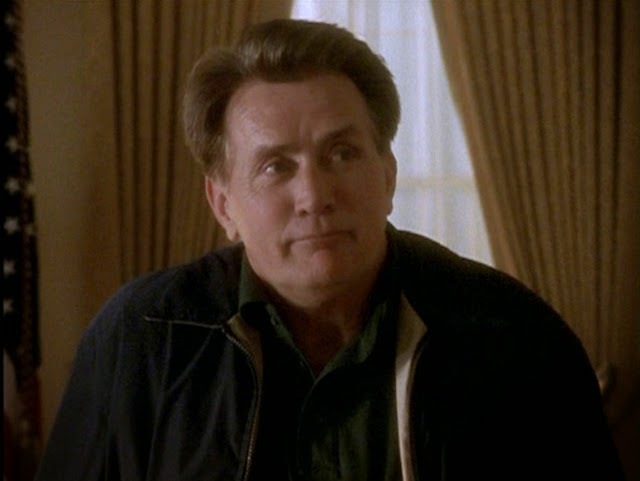 There, in the centre of it all, and not appearing till the last five minutes of that first episode, was President Josiah ‘Jed’ Bartlet, known in the world outside of make-believe as Martin Sheen. If you’re going to have an ensemble of fine actors, speaking words of a quality, clarity and precision rarely seen since the age of black and white movies and black and white news anchors, and then you’re going to have a character who’s in charge of them all, you need someone like Sheen. It’s difficult to prove whether David Tennant, coming into Doctor Who, asked Russell T Davies to mirror his arrival on that of Sheen in the West Wing pilot, but the similarities are remarkable, and Tennant’s an uber-West Wing fan. For the whole episode, Sheen’s President has been a force, important but unseen. When he walks into the room, finally, for those last five minutes, he’s breathtaking. If you haven’t seen it, I won’t spoiler it for you, but in a speech that lasts nearly all of that remaining time, he resolves several of the episode’s crises, pays tribute to another and spits a bolt of fire that makes it impossible to not watch the next episode, just to see more of this incredible performance. Sound familiar, Whovians? Writing that outstripped most if not all of its contemporaries (and continues to this day to outstrip much of what has followed), characterization that feels witty yet real, a subtle mixture of drama and comedy with not a single line wasted on filler, performances that feel both real, nuanced and fitting, and a lead that can walk into a room and draw all eyes, then meander round and round in a single chatterbox scene that blows the doors off everything you’ve seen so far and leave you drooling for more. The West Wing was only to some degree on a level with some of the eye-candy drama at the time – there was no George Clooney to make people swoon, no Alex Kingston to drop jaws. What The West Wing was, is and will continue to be is mind-candy, that engaged, informed, and elevated your hopes and dreams. It used a dramatic form to ask important questions, to clue in its audience about the fundamental, important political debates of the age and the process of government, and it both humanized realized and reinvigorated that most jaded of political footballs – American (for which in a broader sense, read human) exceptionalism in both the political, and in every, sphere of life. The pilot was the ultimate distillation of all of these elements, that it would go on to use in new ways throughout its seven year run. If you’ve never seen it, see it today. If you’ve seen it before – see it again. It’s still better than much else that’s on.